Some words to describe Sister Cecilia might be: prayerful, strong faith and commitment, people oriented, high energy, determination, love of people and life, live until you die! 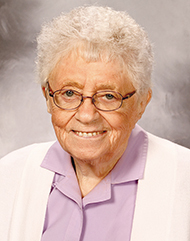 This was how Sister Joanne Peters, Co-Chapter Prioress of the Holy Rosary Mission Chapter, began her eulogy for Sister Cecilia Marie Brown at Cecilia Marie’s Ritual of Remembering on January 15, 2019. 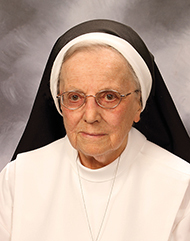 Sister Cecilia Marie was born Barbara Jane Mary Brown in Rockford, Illinois, on November 23, 1923. She was the fourth of six children born to William and Grace (Taylor) Brown. 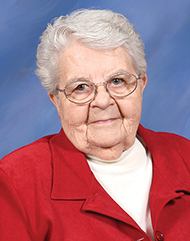 The oldest, Cecilia Marie, was who Barbara Jane took her religious name for when she entered the Congregation. Next came Gordon and Robert; then after Barbara Jane came Marilyn and finally Rosemary. 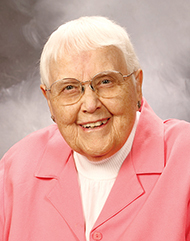 Barbara Jane attended two Rockford parish schools, St. Patrick School through fifth grade and then St. Peter School for sixth through eighth grade, and then went to Muldoon High School, where she met the Adrian Dominicans. The thought of becoming a sister had long been in her mind, but in her senior year – inspired by her home room teacher Sister Grace Alma Glendenning – she made the decision. 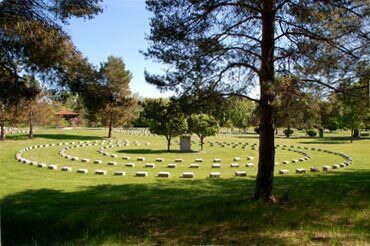 When she died on January 2, 2019, Sister Charles Christine Uhnavy was only six weeks away from a real milestone – her one hundred and second birthday. Eunice Uhnavy was born on February 14, 1917, in Grand Rapids, Michigan, to Charles and Olive (Spitzig) Uhnavy. Charles was born in the U.S. to German immigrant parents, while Olive was born in Ontario, Canada. Charles learned how to be a tailor from his father, who owned a business called The House of Fashions, and he took over the business when his father died. In her life story, Sister Charles Christine remembered her dad as a very good tailor who specialized in women’s clothing and especially liked to work on furs. She also recalled that he once made a cassock for Father Charles Coughlin, the noted radio priest who pastored the Shrine of the Little Flower in Royal Oak, Michigan, the Uhnavys’ parish. Charles and Olive had four children in all: Vivian, Eunice, Arlene, and Charles. After Vivian and Eunice were born, the family moved to Detroit, where Arlene was born, and in 1926 they moved to Royal Oak, where Charles came into the family.